When are Dumb LEDs the Smart Choice? A couple years ago I got into making electronic conferences badges by building a device for DEFCON 25 shaped like a dragonfly. Like all badges the most important design factor was quite literally how flashy it was, and two years ago I delivered on that with ten RGB LEDs. At the time I planned to hand-assemble each and every of the 105 badges at my kitchen table. Given those constraints, and a desire for electrical and programmatic simplicity, I landed on using APA102s (DotStar’s in Adafruit parlance) in the common 5050 sized package. They were easy to place, easy to design with electrically, simple to control, and friendly to a human pick-n-place machine. Though by the end of the production run I had discovered a few problems, the APA102s were a success. This year I made a new and improved version of the dragonfly, but applying my lessons learned led me to choose a very different LED architecture than 2017. I swapped out the smart LEDs for dumb ones. Are Patent Claims Coming for Your WS2812? There are some components which are used within our sphere so often as to become ubiquitous, referred to by their part number without the need for a hasty dig through a data sheet to remind oneself just what we are talking about. You can rattle a few of them off, the 555, the 741, the ESP8266, and so on. In the world of LEDs, the part that most immediately springs to mind is the Worldsemi WS2812 addressable LED. This part consists of three LEDs in red, green, and blue, all in the same package with a serial interface allowing a chain of individually addressable multicolour lights to be created. We’ve seen them in all sorts of places, and if you don’t recognise the part number then perhaps you will by one of the names they’re sold under: Neopixel. Yesterday we received an email from our piratical friends at Pimoroni, the British supplier of all forms of electronic goodies. Among their range they have a reasonable number of products containing WS2812s, and it was these products that had formed the subject of an unexpected cease-and-desist letter. 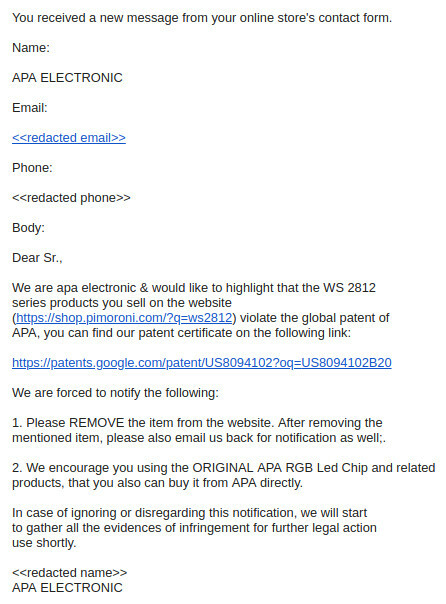 APA Electronic are the manufacturer of the APA102 addressable LED (which you may know as the Dotstar), and their cease-and-desist asking for the products to be withdrawn from sale rests on their holding a patent for an addressable multicolour LED. We’d be very interested to hear whether any other suppliers of WS2812-based parts have received similar communications. US patent number 8094102B2 is indeed a patent for a “Single full-color LED with driving mechanism”, which does look a lot like a WS2812. But as always, such things are not as cut-and-dried as they might first appear. The LED in the patent for example relies upon a clock line for its operation, while the Worldsemi part doesn’t. I am not a lawyer so I’d hesitate to call this a baseless and speculative move, but I suspect that there will be plenty over which the two semiconductor companies can duke it out in the courtroom. It’s fair to say that a large part of the ethos of our movement shares something with that of the world of open-source, so news of legal manoeuvres such as this are never likely to go down well. We’re small fry in this context and our commercial influence on APA102 or WS2812 sales will be minimal, but inevitably APA’s standing in our eyes will be diminished. Companies such as Pimoroni are not the target but a piece of collateral damage in a battle between manufacturers. Whether the patent has been violated or not can only be decided by the courts. It is not uncommon for patent holders to go after companies selling the “infringing” products in hopes that rather than risk a costly court battle, they simply adhere to the demands, in this case buying parts from APA and not from Worldsemi. So, if you rely on addressable LEDs, watch out! There may be trouble ahead. Header image: Tristan Robitaille [CC BY-SA 4.0]. Adafruit has long been the undisputed ruler of the smart LED product, with their WS2812B (NeoPixel) and APA102C (DotStar) product lines dominating due to the robust assortment of sizes and form factors, as well as their ease of use. SparkFun Electronics recently announced Lumenati, their new line of APA102C breakouts that feature some intriguing features which do a good job of distinguishing the two lines. First, the screen-printing on the boards include pixel numbers. We were working on NeoPixel assemblies the other day and keeping track of pixels was a nightmare. In addition, the Lumenati boards are meant to combine into larger creations, allowing you to make complicated shapes. SparkFun supports this by giving the boards castellated headers — far better than the solder pads! If you are running into logic conflicts with the boards you can solder in jumpers to bypass the data connections and control individual boards separately. On the down side, SparkFun’s intitial offerings — 6 products — still can’t compete with Adafruit’s, like their 255-LED disk, shields, strips, matrices, and flexible PCBs. WS2812B LED Clones: Work Better Than Originals! Commodity electronics manufacturing is a tough game. If you come out with a world-beating product, like WorldSemi did with the WS2812B addressable RGB LED “pixel”, you can be pretty sure that you’re going to be cloned in fairly short order. And we’re all used to horror stories of being sold clones instead of what was ordered. But what if the clones were actually an improvement? [Gonazar] bought some strips of “WS2812” LEDs and prototyped a project. When stepping up to larger production, he thought he’d go directly to WorldSemi. Long story short, the cheaper LED modules that he’d previously bought weren’t from WorldSemi, but were actually SK6812 clones labelled as WS2812Bs. When he switched to the real thing, he discovered that they had some temperature and pressure sensitivities that the clones didn’t. The clones were better! They weren’t even straight clones. It turns out that they have a much higher PWM frequency, resulting in less flicker at low brightnesses. The distributor came clean, saying that they swapped them out without note because they spoke the same protocol, but were a strict improvement. Hackaday was in Portland last weekend for the Open Hardware Summit. I did a brief recap earlier this week but this post has been on my mind the entire time. The night before the summit, OSH Park (the Purveyors of Perfect Purple PCBs which we all know and love) hosted a Bring-A-Hack at their headquarters. [Laen] knows how to throw a party — with a catered spread and open bar which all enjoyed. The place was packed with awesome hackers, and everyone had something amazing to show off. In fact, there were far too many people showing off hardware for me to capture all in one evening. But join me after the jump for six or seven examples that really stuck out.